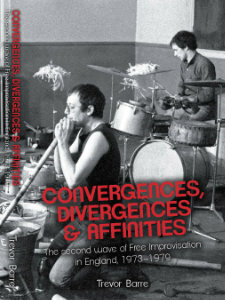 The much anticipated follow-up to his Beyond Jazz , Trevor Barre’s Convergences, Divergences & Affinities continues the story of early English free improvisation, tracing the path of the music from 1973 to 1979. 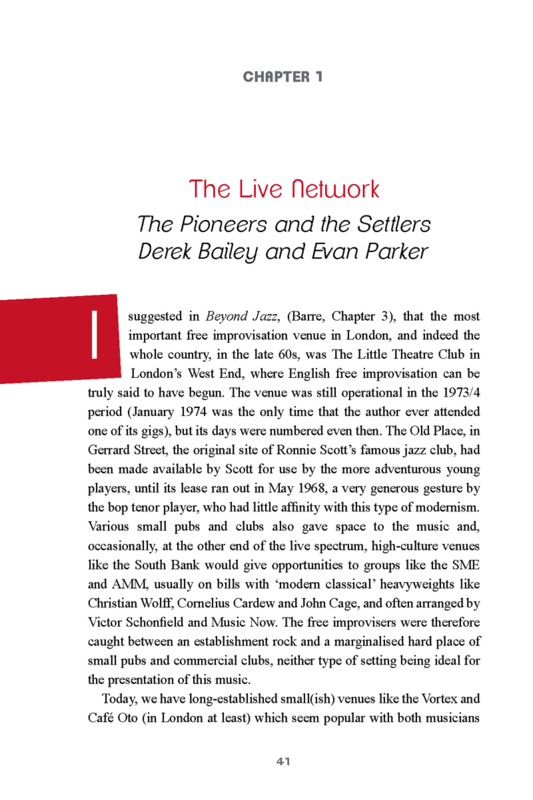 It follows the progress of the early pioneers and the formation of the ‘second generation’ of improvisers, examining how they continued to develop the sound through such outlets as the London Musicians Collective, Company and Musics magazine. Particular attention is given to the regional scene and to the formation of various collectives across the country. Barre’s new book is another very readable history of the initial period of one of the most radical and misunderstood musical genres of the 1960s and 70s. 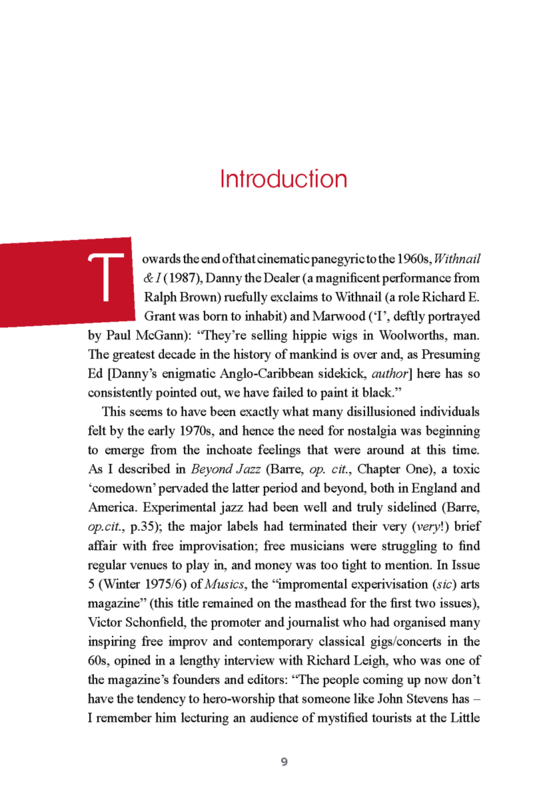 How did Free Improvisation, aka Free Music emerge? And how has this most arcane of musical forms survived so long and gained such loyal adherents? Trevor Barre seeks to answer these questions in Beyond Jazz, the first book solely devoted to the so-called ‘First Generation’ of Free improvisers. 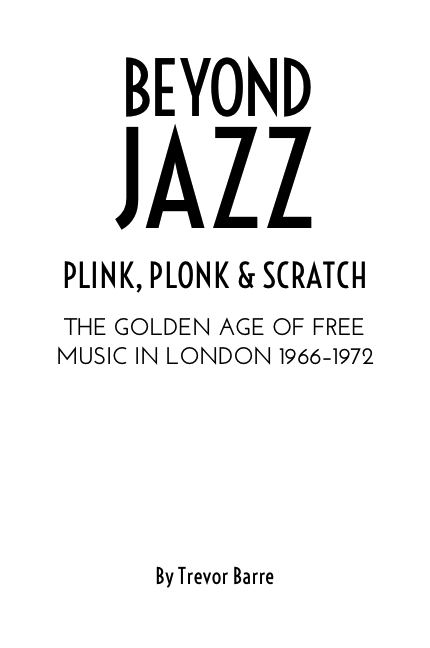 Beyond Jazz is an account of the genre’s formative London years. It retraces the road that led from the music’s emergence in late 1965/early 1966, through to its consolidation and acceptance as a serious ongoing musical form by 1972, an outcome that was by no means inevitable during the intervening years. 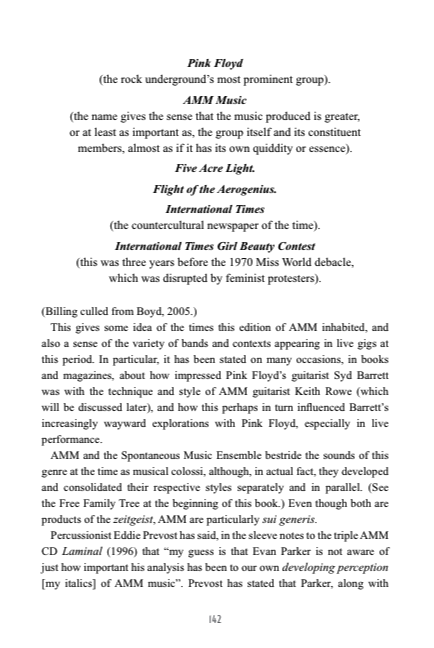 In January 1966, the Little Theatre Club opened and Cornelius Cardew joined Spontaneous Music Ensemble; in 1972 the BBC excluded free music from its Jazz Club programme. Trevor Barre takes these dates to cover the emergence of free improvisation/free music in the UK — to be precise, in London. 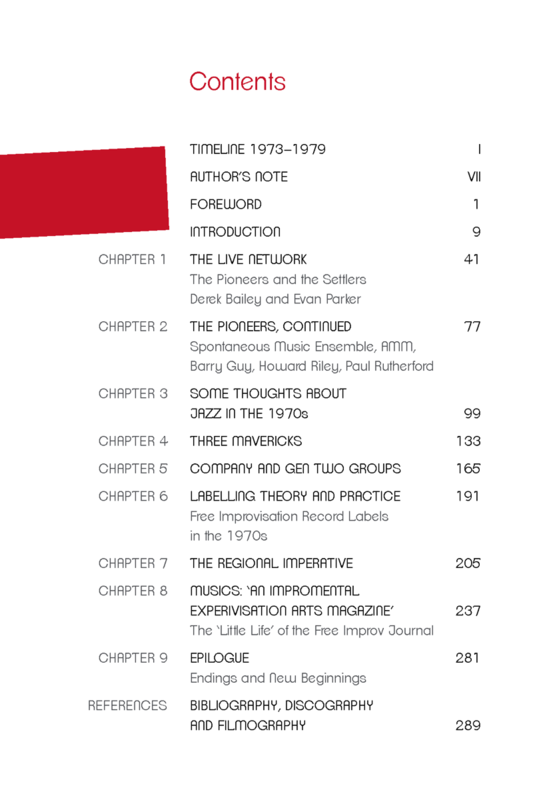 It's the first book-length treatment of the first generation free improvisors — Derek Bailey, Evan Parker, Eddie Prevost, Tony Oxley, Paul Lytton, Howard Riley, Keith Rowe, John Stevens, Paul Rutherford, Trevor Watts, with their groups including Spontaneous Music Ensemble, AMM, Iskra 1903 and Music Improvisation Company. The subtitle, "Plink, Plonk And Scratch", refers to an SME recording. a fancy way of saying that [Bailey] doesn't sound like anybody else". Another way, I reckon, is to say that geniuses — usually unwittingly — found their own school. The comment that hard bop is a conservative style, in which it's impossible to make an original statement, looks to be a definition masquerading as an insight: hard bop just describes a style that's solidified, or 41' ossified, into a genre. The original talents who had affinities with it — Mingus, Rollins, Dolphy — can't simply be subsumed under it. Barre is unduly modest about his powers of musical description and criticism. There's genuine insight here, such as his views on the musical synchronicity that saw British free improv flourish as the AACM was developing a similar vocabulary in Chicago —reiterating an earlier synchronicity between Joe Harriott and Ornette Coleman. Barre's description of John Russell as the guitarist closest in style to Derek Bailey is judicious. 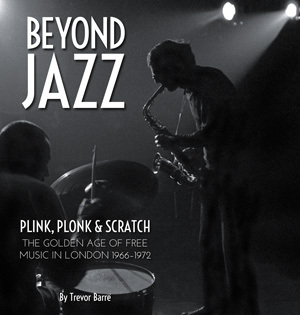 A succinct, personal, opinioned and ultimately insightful volume about the so-called First Generation of British Free Musicians, Beyond Jazz is first-time author Trevor Barre’s crisply-written, well-informed overview of the scene during those crucial seven years. A little too young and living elsewhere in the U.K., to have participated in most of the seminal London-based performances of that era, Barre’s turned to contemporary journalism, some academic studies and most importantly correspondence with 21 Free Music mover and shakers to fill out the story. Out Of Nowhere, the Uniquely Elusive Jazz of Mike Taylor is an exhaustive near hagiography tracing the brief career of a British pianist whose career began and ended in the 1960s and whose particular music and short life characterized all that was good and bad about the improvised and overall music scene during that representative decade. While he does have pedantic moments – humorously labeled as such – and spends a little too much time advancing his adoration of some seminal Free Music albums, Barre usually strikes the right note between fan-boy enthusiasm and measured second thought. Plus he gives space to less Free Music committed viewpoints, including that of his wife, whose sardonic asides function much the same way as comments from the spouse of food writer Calvin Trillin do in that author’s Tummy Trilogy books. Like an anthropologist situating in its proper context the ethnic tribe he’s studying, Barre itemizes the circumstances that allowed the particular British brand of Free Music to germinate and flourish. Besides the supposition among some musicians late in the 1950s that unless an original concept developed, even advanced British Jazz would continue to operate in the shadows of the American innovators, different experiences were creating restive, self-taught or schooled musicians ready for change. Some like future Spontaneous Music Ensemble (SME) members drummer John Stevens, saxophonist Trevor Watts and – a strange indoctrination for an avowed Communist – trombonist Paul Rutherford, studied music in the military. Others like bassist Barry Guy and pianist Howard Riley came from academe. Cellist Cornelius Cardew, a founder of AMM and bassist Gavin Byers, an early associate of guitarist Derek Bailey, were part of the so-called classical world. Others, such as drummer Eddie Prévost and guitarist Keith Rower, both in AMM, and drummer Tony Oxley and Bailey were jobbing musicians mostly involved in Jazz. At the same time the Baby Boom predilection for so-called advanced Rock, typified by the Mothers of Invention and other innovators, so confused music business gatekeepers that there was briefly space for all sorts of strange experiments. What that meant was that a young fan such as Barre could read about avant-garde players in the music press and hear their LPs on the radio; audience could sometimes see these musicians play in the same clubs as psychedelic Rock bands such as Pink Floyd; and major record companies like Columbia, RCA and Elektra released these Free pioneers first LPs. Without resorting to Gnostic angels-dancing-on-pinhead designations, Barre is able to trace and analyze the music of these advanced groups through deep listening to representative high quality music recorded at the time, though in some cases not released until year afterwards. He also appends a valuable list of published sources and recommended records at the end of each chapter. 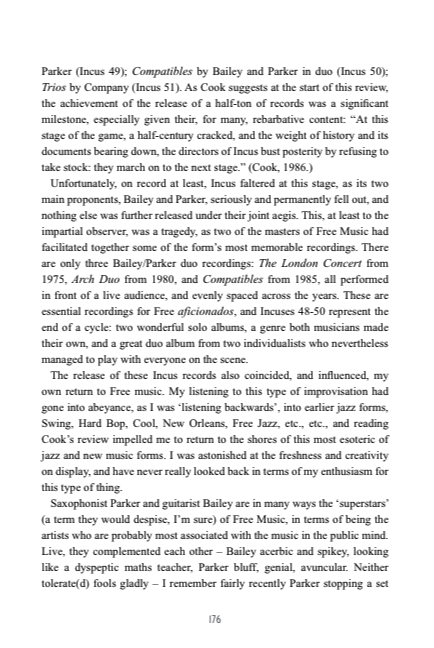 Essentially Free Music in the main examines that period through its four major groupings: The SME and its offshoots; AMM; the improvisers clustered around Bailey, especially saxophonist Evan Parker; and a quartet of so called super groups: Iskra 1903, Oxley’s bands, Riley’s trio with polymath bassist Guy (also in Iskra) and the very short-lived Music Improvisation Company. At certain points members of these cohesive groups would replicate the politics of the warring Balkan states pre-World War One, with divisive ego clashes such as those which affected Stevens and Watts and Parker and Bailey; or the fissure due to radical politics that led to the estrangement(s) between Rowe and Prévost. The author tries to outline these situations, which today resemble teapot tempests more than all-out wars. Barre also provides a chapter tying up loose ends and pointing out the continued vitality of the music at some London venues plus its propagation and extension through experiments from members of the so-called Second, Third etc. waves of Free Improvisers. Of course, some First Generation innovators, most notably Parker and Guy, continue to impress and grow musically in their late sixties and early seventies. Nineteen seventy-two was chosen as the cut-off point for this narrative, not because all the sonic challenges had been met, but because of a generational shift in attitudes and actions among music and musicians. As Rock became more corporate the major labels lost interest in recording minority sounds. This was around the same time radio play and media coverage also became limited. British arts funding was cut back as well. That result was that many of the players who dabbled in Free Music returned to or began concentrating on other musical avenues such as mainstream Jazz, Jazz-(Prog) Rock or so-called Classical compositions. Marginalization at home led to more intense partnerships among exploratory British musicians and their continental counterparts. No longer was the music exclusively and distinctively British. Plus once newer players, influenced by Punk’s D-I-Y ethos and more intricate experiments with sound and electronics joined the fold, Free Music’s shape changed along with its definition. A fair percentage of the UK’s pioneering Free musicians are still around. Following the so-called (neo-Con) Jazz Revival of the 1990s many are able to benefit from the increased opportunities to record on the multitude of mini-record labels that were created following the examples of Incus and Emanem, and to play at small venues and off-side music festivals world-wide that first grew from the self-help ethos of Free Music. Pianist Mike Taylor’s will-o-wisp career intersected slightly with the Free players lionized in Barre’s book but his career was more mainstream and ultimately tragic. Taylor (1938-1969), was a jobbing pianist and composer who, in the early 1960s, was working on a synthesis of Bill Evans’ and Horace Silver’s keyboard-centric sound with European notated music and aiming towards creating a unique sound. While he did play at the SME and Incus Records-affiliated hangout The Little Theatre club, it was just one of the many pubs, clubs and concerts at which he found work until, drug dependency, mental illness and finally suicide by drowning in the Themes river, curtailed a promising career. Besides Taylor’s sidemen were less singular in their pursuits than the committed British improvisers. Like teenage girls in a clothing store, they tried many genres of music on for size – dance band, Blues, R&B, and studio work as well as Jazz. Some, including drummer Ginger Baker and bassist Jack Bruce who formed Cream; drummer John Hiseman who led Colosseum; and saxophonist/organist Graham Bond; went on to a form of Rock stardom. Luca Ferrara’s exhaustive, if somewhat plodding, volume tries to piece together the shards of Taylor’s life. The initially fastidiously dressed pianist, who also had a day job as a salesman, was notoriously uncommunicative about his art even to fellow musicians who played his knotty compositions and arrangements. Following the breakup of his marriage, coupled who a general lack of recognition for Jazz in what become Beat Music obsessed London, Taylor, whose only previous deviation from then straight life was consumption of marijuana was transformed Jekyll-and-Hyde-like into a hippie-LSD freak. More-than-daily Acid trips turned his standoffishness into non-communication, his appearance to that of a tramp with unkempt hair and beard and barefoot, and his instrument of choice a broken clay drum. Ferrara has combed through as many of the official documents, contemporary media and interviews with Taylor’s friends and fellow musicians, most notably Hiseman, bassist Ron Rubin and as many others as he could find, to build this published monument. Unfortunately like that Gertrude Stein said about Oakland, California, “there is no there there” could also apply to Taylor’s non-musical life. Someone whose demand for complete control led to him exactingly capture his own scores on self-drawn score paper – and whose mental problems led him to toss his scores into the garbage can near the end of his life – the pianist would brook no compromises. By happenstance some scores were rescued by a passing friend. Taylor’s two LP releases, now collector’s items that change hands for hundreds of pounds, were recorded only through the enthusiasm of engineer/producer/studio owner Denis Preston, and once the pianist became immersed in the drug-hippie-psychosis-homeless culture it was only Rubin who secured him a few gigs where he frequently didn’t show up, wouldn’t play or merely mumbled at the few audience members. Ironically, as the author points out, even though the Taylor band opened for Ornette Coleman at one well-remembered London concert, what renown the pianist has now is related to happenstance. Three of his co-compositions were included in rock band Cream’s best-selling Wheels of Fire two-LP set, making his name a footnote for obsessive Brit-Rock collectors. Drummer Baker, who is listed as co-composer, had played with Taylor. More crucially, the all-star British New Jazz Orchestra, directed by Neil Ardly, recorded three of Taylor’s compositions on LP in 1968 and 1970 which fit seamlessly among the other Jazz classics on the disc. Of course the orchestration was by Ardly from Taylor’s original lines; with a similar job done on the dozen Taylor tunes that made up 2007’s Mike Taylor Remembered session, the scores of some were those rescued from incineration. 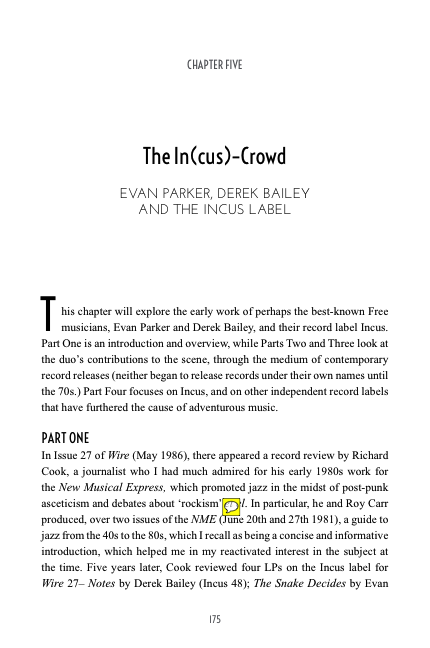 Out of Nowhere encompasses the virtues of oral history: dogged research, exhaustive detailing and reproduction of key items in Taylor’s life and music. But it also includes most of the genre’s many faults: repetition of too much minutia; reliance on suppositions from various sources without strong enough editorial judgment; inflation of minor or everyday episodes to life-altering experiences; and the usual sloppy foot-noting, imprecise language and fear of excising extraneous details that plagues labors of love such as this one. For what it is, the story clips along at a racehorse-like gallop and provides details otherwise ignored in music books dedicate to famous players. But in the end nostalgia for, obsession with, or knowledge of that particular epoch in British music would aid in appreciating the book. On the other hand, with its wealth of well-researched information, Beyond Jazz can serve as a suitable historical introduction to the music for those who have just discovered the genre through one of its hyphenated offshoots like Free-Rock or Improv-Electronics. Considering the insights offered by the players who communicated with Barre, like shining facets of a precious stone revealed under a microscope, there is even new information to digest for the grey-or-fewer hairs that have followed the style from its beginnings. 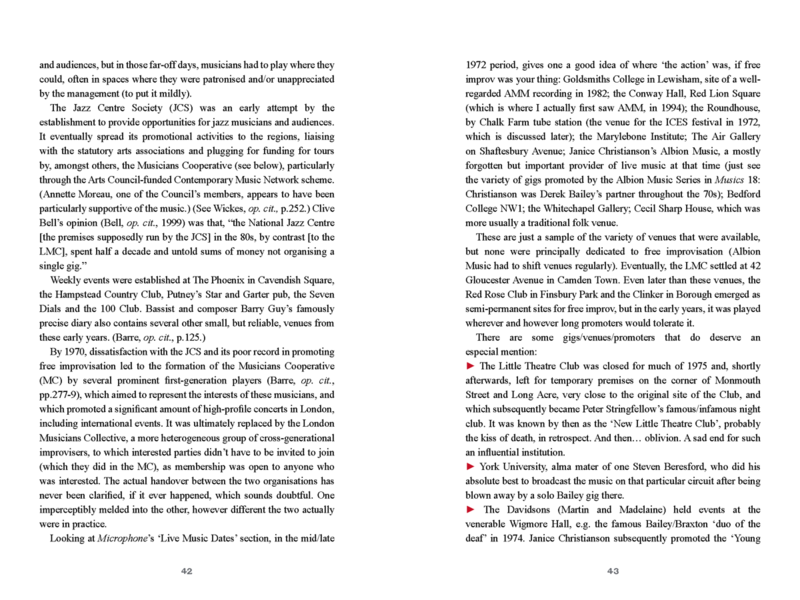 “The dates mentioned in the title roughly bracket the first wave of free improve in the UK, from the opening; from the opening of the legendary Little Theatre Club and Cornelius Cardew’s joining of SME, both in January 1966, to the BBC’s decision to cut avant-garde jazz from its Jazz Club programme in March 1972. 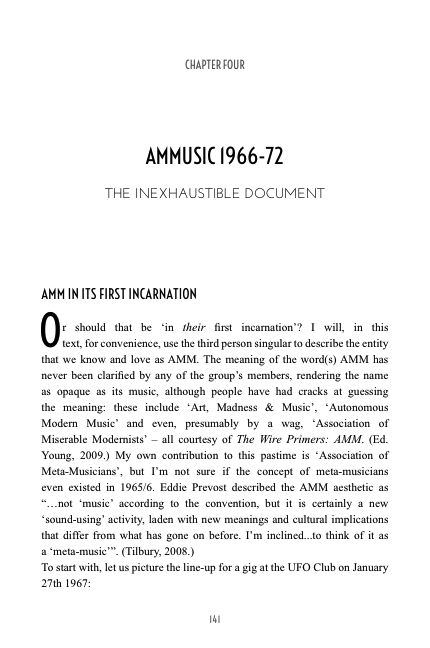 It may have been just a few years, but – in keeping with the general social and artistic turmoil of the late 1960s – a huge amount of territory was staked out by the music’s main first generation protagonists, who Barre rightly identifies as Spontaneous Music Ensemble, AMM, Evan Parker, Derek Bailey and offshoot units such as Trevor Watts’ Amalgam and Paul Rutherfords’ ISKRA 1903. Barre provides detailed overviews of all these groups and artists as well as key albums of the period – but falls short, in both cases, of actually describing the music, even going as far as to claim that it is “impossible to fully convey in words”. For a book that seeks to pinpoint and explain the genesis of a radical new form of musical organisation, this is surely a major drawback. In fact, much of Barre’s writing is rather clumsy, sitting somewhere between a scholarly treatise and an amateur fanzine. 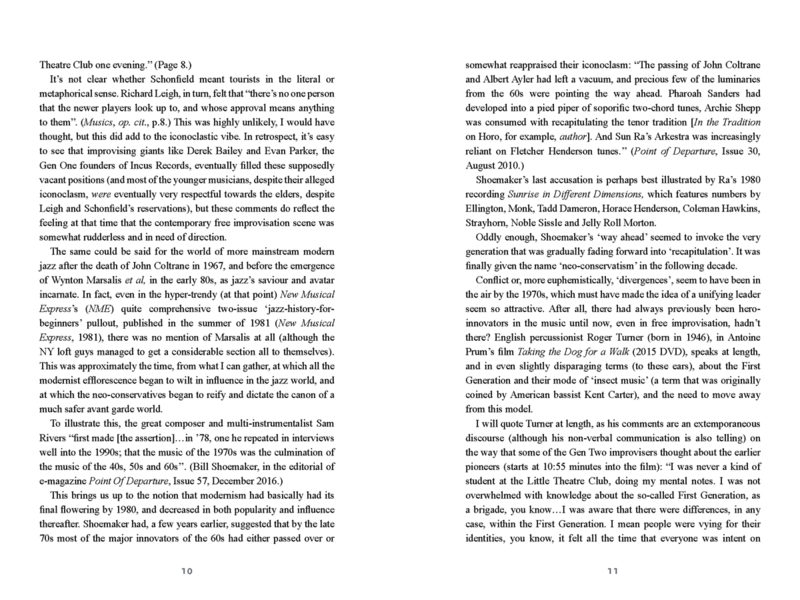 Even so, there’s enough genuine insight to make this a compelling account, such as his theories on the musical synchronicity that saw Brit improve blossom at the same time as the AACM was developing a similar vocabulary thousands of miles away in Chicago – in exactly the same way that, a few years earlier, Joe Harriot’s free-form experiments unwittingly echoed Ornette Coleman’s contemporaneous experiments. 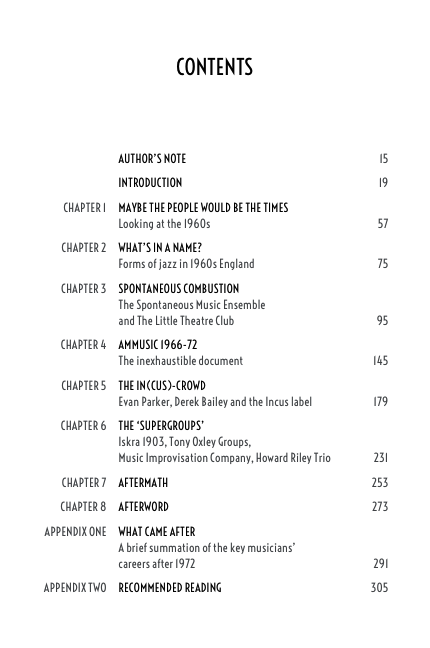 In all, it’s a highly readable appraisal of that most English of musical revolutions”. Trevor Barre has been a fan of the music since the early 70s. Since retiring as a mental health nurse, he has found the time to translate his enthusiasms into the written word. Many moons ago, he managed a record shop, which aided his burgeoning vinyl dependence. 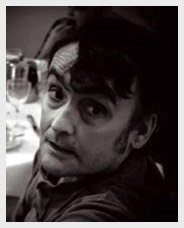 He has lived in London for 34 years, usually within striking distance of improvised music venues, and has three children.